A Disneyland Resort vacation is the perfect way to start your life long love for Disney travel. With a Disneyland Resort vacation you can spend more time together as a family creating Magical memories. Immerse yourself and your family into the magic and wonder of Disney by walking between 2 theme parks and visiting where it all began. Walk in Walt’s footsteps by taking that first step into the Disneyland Theme Park. Look up at his apartment window and imagine Walt looking out on all he created and dreamed. At the Disneyland Resort you will explore and experience attractions, events and celebrations that are unique to only Disneyland such as World of Color and the all new Pixar Fest! Disneyland is a place where Dreams Come True! Did you know that over the summer Disney has added mobile ordering to its quick service restaurants? What is mobile ordering you ask? It is like a fastpass for food! Instead of waiting in a long line to place your order and then waiting for your food to be ready, you’re able to order on the go from your phone, bypassing the ordering line and picking up your food directly at the counter when you arrive at the restaurant. The whole process is done through the My Disney Experience app on your phone. If you start from the home screen of your My Disney Experience app, you will see the “Order Food” button just below “My Plans”. After hitting “Order Food,” you’re taken to a page with the current list of restaurants that offer Mobile Ordering. After choosing a restaurant, you click order food and you are directed to the “Build Your Order” screen. From there you can select any item that is on the menu. I chose the Fajita Platter and after adding the item to my order, and clicking the bag in the upper right corner of the screen, you can adjust the quantity of the item or add extras, like fountain drinks and desserts. At this point, you click purchase and get an order confirmation. When your ready to eat all you need to so is tap the “I’m Here, Prepare My Order” button, the app notifies the kitchen to prepare the meal. Depending upon whether you place your order near the restaurant or not, you may not see this screen immediately. The prompt appears even before being physically inside the restaurant. You’ll then be alerted, through the app, to pick up your meal at the Mobile Order pickup line. Currently, the only downside to Mobile Ordering is that it only accepts credit cards and it does not accept Disney Dining Plan credits and you cannot use discounts at restaurants that offer them, such as for the Annual Passholder or Tables in Wonderland. Next time you in the parks and are looking to save some time instead of standing in a long quick service line, try the mobile ordering – it could save you some valuable park time! The D23 Expo is wrapping up in Anaheim, California, but we now know what’s coming to the parks and beyond thanks to an absolutely amazing Disney Parks and Resorts presentation. For those of you who are unfamiliar with the D23 Expo, it’s a celebration of all things Disney. Major announcements are made for new projects as well as updates to projects that are already underway for the Parks and Resorts. A new theater is coming to Main Street USA! Inspired by Kansas City’s Willis Wood Theater, this theater will be a new venue for world-class entertainment. The Tron Coaster will be coming over from Shanghai Disneyland. The attraction will be adjacent to Space Mountain in Tomorrowland and is scheduled to open for Walt Disney World’s 50th anniversary in 2021. A Ratatouille attraction will be coming to the France Pavilion in EPCOT. Guests will be able to shrink to Remy’s size and navigate across a kitchen with the sights, sounds and smells of Gusteau’s legendary Parisian restaurant. According to Disney leaders, this attraction will open in time for the 50th anniversary of Walt Disney World in 2021. Another addition to Epcot will be based on the “Guardians of the Galaxy” and is the next step in how guests can encounter these characters at the Walt Disney World Resort. With the addition of this attraction, Ellen’s Energy Adventure will be closing August 13, 2017. It is also scheduled to open in time for the 50th anniversary of Walt Disney World in 2021. Disney’s announcement about Mission Space contained two parts. The first part is that an all-new mission will be added to the green side of the attraction, which will allow guests to orbit the Earth. The second part is that a new table service restaurant will join Epcot and offer amazing meals with spectacular views high above Earth – from space! This restaurant, which will be located adjacent to the park’s Mission: SPACE attraction; will invite guests to travel into space for dining experiences in the stars. The Star Wars-inspired lands that are currently under construction at the Disneyland and Walt Disney World Resorts are slated to open in 2019. The new lands, which will be called Star Wars: Galaxy’s Edge, will allow guests to visit a remote trading port in space where Star Wars characters and their stories come to life. The lands will feature two major attractions that put guests in the middle of a battle between the First Order and the Resistance. Each attraction – and even the land itself – will offer guests the chance to immerse themselves in the Star Wars universe like never before. One attraction will make you feel like you’re on a Star Destroyer inside a hangar bay. It’s an attraction built on a scale we’ve never seen before. A new attraction featuring Mickey Mouse is coming to Disney’s Hollywood Studios at the Walt Disney World Resort! Details shared about the first Mickey-themed ride-through attraction are that it will feature a new story with a new singable theme song as well as a new experience Disney is calling “2 1/2 D.” No glasses required. Walt Disney Imagineer Kevin Rafferty said teams are inventing new technologies that turn the flat world of a colorful cartoon short into a “dimensional display of amazingness.” With the addition of this attraction, The Great Movie Ride will be closing August 13, 2017. Toy Story Land, currently under construction at Disney’s Hollywood Studios, will officially open in Summer 2018. Soon you’ll be able to shrink to the size of a toy to explore the world of Andy’s backyard with your favorite Toy Story characters, experience Slinky Dog Dash, and Alien Swirling Saucers. At this new exciting resort you will become part of a Star Wars story! At check in you’ll immediately become a citizen of the galaxy and experience all that entails, including dressing up in the proper attire. Once you leave Earth, you will discover a starship alive with characters, stories, and adventures that unfold all around you. It is 100% immersive, and the story will touch every single minute of your day, and it will culminate in a unique journey for every person who visits. A new exciting transportation system is coming to the Walt Disney World Resort called the Disney Skyliner. It will offer a birdseye view of the Resort and connect Disney’s Art of Animation, Pop Century and Caribbean Beach resorts and other locations with Disney’s Hollywood Studios and The International Gateway at Epcot. An all-new Minnie Van service will provide a point-to-point transportation service, giving guests an even more seamless resort vacation from start to finish. Minnie Van will be priced at $20 per trip per vehicle, and the service is planned to begin late July 2017 at Disney’s BoardWalk and Yacht Club Resorts. The service will then expand to more locations throughout Walt Disney World. Disney Cruise Line has also announced they’re expanding their fleet with yet an additional new cruise ship, making it three new ships on their way. That means by 2023, Disney Cruise Line will nearly double the size of their current fleet! Over the last few days, The Walt Disney Company has announced some exciting openings coming over the next few months and years. The first announcement was the official opening date, of May 27 for Pandora in the Animal Kingdom Park. Inspired by James Cameron’s “Avatar,” this will be a 12-acre land, which will immerse guests into the world of Pandora. This new area will include floating mountains, bioluminescent rainforests, and flying “Banshees,” Disney said in a news release. On February 17, “Rivers of Light,” an all-new nighttime show at Disney’s Animal Kingdom will debut. The 15-minute show was originally set to debut last April, however technical issues delayed the opening of the show until this month. The theatrical show celebrates nature and its connection with humans by combining live performances, floating lanterns, and special effects. Also announced, the long running, night-time spectacular Wishes, is set to be replaced with a brand new show called “Happily Ever After” on May 12. This show will feature fireworks, projections and lasers. It will draw on such Disney films, including “Pirates of the Caribbean,” The Jungle Book,” “Beauty and the Beast,” “Moana,” “Brave,” “Big Hero 6,” “Zootopia,” “The Princess & The Frog,” “Aladdin,” The Little Mermaid,” “The Lion King,” “Frozen,” “Toy Story,” “Peter Pan,” “Sleeping Beauty,” and “Hunchback of Notre Dame.” The crowd’s favorite moment, Tinker Bell’s flight, will continue to be a part of the new show. For Star Wars fans, the news came that we can expect to see that new land open in 2019. The Star Wars Land in Hollywood Studios in Florida and also at Disneyland Park in California will be based on the blockbuster movie franchise. It will feature two new attractions, including a ride that lets visitors pilot the Millennium Falcon. At each location, guests will be transported to a never-before-seen planet – a remote trading port and one of the last stops before wild space – where Star Wars characters and their stories come to life. Disneyland is Walt’s original dream come to life. It is full of rich Disney history that is just waiting to be uncovered. My tip for the best Disneyland experience is to take the “Walk in Walt’s Disneyland Footsteps” guided tour. Not only will you experience the park in a new way but you will also be immersed in a new perspective of Walt’s vision come to life. If you are a fan of any Disney park this tour will provide you the history and background of Walt and how he came up with the ideas for Disneyland, which eventually led to Walt Disney World and other Disney parks throughout the world. While this tour is a large chunk of time and does involve a good amount of walking it is absolutely doable for any individual. Tour guides take into account the needs of each individual and there are even relief breaks. It also has some of the normal Disney tour perks such as entering the park early before opening, backstage access, an included lunch and even a keepsake pin. However, what sets this tour apart from other tours is that during it you will feel like you are inside Walt’s head as he deals with the challenges and rewards of creating Disneyland. You hear clips of Walt himself talking to various Disney legends about his vision and dreams for the park. As you are guided through the park hearing Walt’s voice along with information from your tour guide you can just imagine Walt walking through the park and standing in the same spot as you are standing, making history feel so real. There are two ultimate experiences of this tour which make it a best way to experience Disneyland. But as anything great in life you have to wait until the end of the tour for them. While your group moves back to Main Street to conclude the tour you are taken to experience Great Moments with Mr. Lincoln. The group is given some extra time in the theater along with additional history of how it was brought from vision to life. While sitting there you begin to gain a greater understanding of that vision and respect for Walt’s innovation. The real life look of Mr. Lincoln leads you to believe it must be an actor on the stage. This really gets you thinking about the parks and the creative genius Walk was. He had jumped ahead of his time to create this attraction and pioneer animatronics. As your group exits the theater you are taken to photographs that explain Walt’s final days. It brings about emotions that connect you to Walt as a real person not simply a creator of Disneyland. After this the tour continues with a walk in front of the train station listening to Walt’s favorite song “Feed The Birds” from Mary Poppins. During the time standing there in front of the train station, with the song playing, you look down Main Street towards Sleeping Beauty’s Castle and think none of this would be here without Walt. While you are thinking this tour could not get better you are broken into two groups to take turns for the best experience yet. One group has lunch while the other tours the much talked about apartment above the fire station. This is where Walt and his family stayed during the construction of Disneyland and following years. This is the place I believe every Disney fan needs to visit. It is the pivotal high point of the tour. As you enter Walt’s apartment you can just imagine Walt being there and looking out over Main Street. You can envision him standing at the window seeing his dreams become a living reality. While you are not allowed to photograph the apartment the tour guide takes a photo of each individual with their own camera standing where Walt stood. You’ll want to make sure you do not forget your camera! During the fun and festivities of the remainder of the day I kept reminding myself that this was started by a man with a vision and dream to make a place people could come to enjoy experiences as a family. To really experience the parks I feel we need to know the love, hard work and sacrifice that was put into creating this magical place. Each time I go back to Disneyland I look up above the fire house to the apartment where the lamp always burns in the window. I say thanks to Walt, the man who I know is always looking out that window and smiling. Now doesn’t this sound like some summer fun! Beginning May 27, 2016, you can join Kristoff and Olaf for the inaugural “Frozen” Games to be held at Disney’s Blizzard Beach Water Park! A “Snowball” Toss – in Florida? Well actually pairs will compete in a snow-themed water balloon toss. Ski Pole Limbo, a snowy twist on traditional limbo—using a ski pole as the limbo bar! How low can you go? Slide Races that allow teams to race down one of the signature water slides at Blizzard Beach. Who has ever raced down a snow hill on a toboggan? 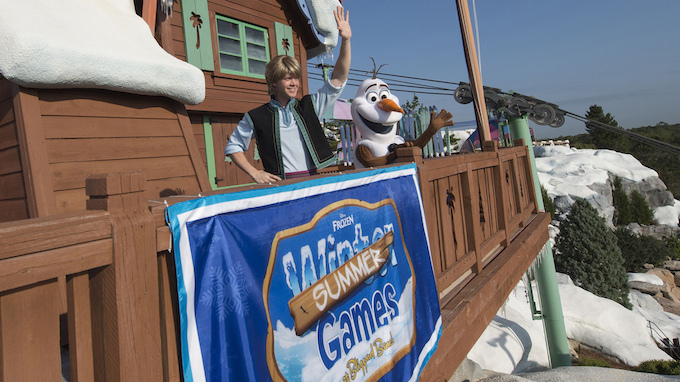 Your team leaders, Olaf and Kristoff will be on hand, appearing on the Observation Deck near Summit Plummet to take part in the opening and closing ceremonies and giving updates on their teams’ progress throughout the day. You can sign-up for this all-day event upon arrival at the park entrance. All activities are included in regular admission to Disney’s Blizzard Beach Water Park. How much are you willing to pay for an After Hours Event at the Magic Kingdom? Is $149 plus tax per person really worth it? Disney After Hours, a new, l ate-night separate ticketed experience is underway at Magic Kingdom Park and it’s offering guests an experience like never before, or so the website says. For 3 hours you can experience 25 different attractions in the Magic Kingdom with little or no wait. While this ticket allows you to enter the park at 7 pm to enjoy dining, evening entertainment like fireworks, the “Celebrate the Magic” nighttime projection show and the Main Street Electrical Parade, your After Hours Event does not officially begin until the park closes for regular paying guests. This means that for the first hour or so you are still sharing the park with guests who have not paid for the After Hours Event. While, they will not be able to get into an attraction line without the special pass, if they are in line, or just walking around it will be up to the Cast Members to usher them towards the Exits. This is similar to how any of the separate hard ticket parties work in the Magic Kingdom. 1. Access to Attractions with little to no wait – More than 25 attractions remain open during Disney After Hours. A limited number of tickets are sold for each event night, meaning significantly shorter – or maybe even no lines! – Disney has not released the number of tickets that will be sold, but it is my understanding that it will be significantly less than the MNSSHP and MVMCP tickets. 2. Park Access – While the Event begins after regular park closing, your ticket allows admission earlier. The Disney After Hours ticket allows you in the park at 7 p.m. so you can enjoy the evening parade and fireworks. So, if you wanted to spend your day at another park and don’t have the Park Hopper Option on your Theme Park Tickets, this is one way to “hop” on over to the Magic Kingdom. 3. Meet Characters – both Mickey Mouse and Disney princesses are available for photo ops, usually again with much shorter lines. Do your children want that elusive picture with their beloved Character, this may be the chance you have been waiting for. 4. Amazing photo ops – Have you ever wanted to take that perfect picture of your favorite attraction lit up at night? The perfect family picture in front of Cinderella’s Castle without a crowd behind you? Smaller crowds may make that possible. 5. Ice cream included – Mickey Premium Bar lovers won’t want to miss out on this part of the night. Beverages are also included. How many Mickey Bars can you really eat? If you have gone to this After Hours Event, let us know your opinion? While summer is about to awaken at Walt Disney World® Resort, it’s never too early to start planning for fall and fun-filled special event nights at Magic Kingdom® Park. Plus, Disneyis hard at work on another new show for Mickey’s Very Merry Christmas Party. 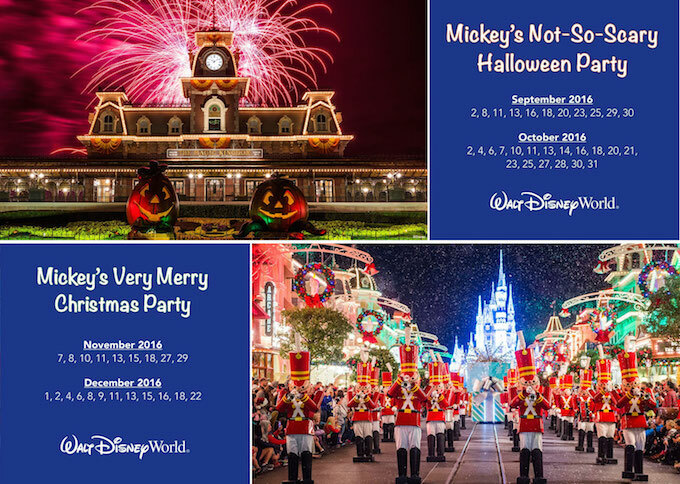 “Mickey’s Most Merriest Celebration” will make its debut for the 2016 holiday season. In this all-new show, Mickey and his pals invite some of their friends for an unforgettable Christmas party filled with music, dancing, color and fun. You can look forward to seeing Woody and Jessie from “Toy Story,” Fantasyland friends such as Peter Pan and Snow White, and many more. Presented on the Cinderella Castle Forecourt Stage, this new show features special effects, magical projections and festive holiday music. Mickey’s Not-So-Scary Halloween Party – Advance ticket prices starting at $72 for adults and $67 for children (3-9). Mickey’s Very Merry Christmas Party – Advance ticket prices starting at $86 for adults and $81 for children (3-9). Pricing varies by date. Contact your travel planner for specific date pricing. 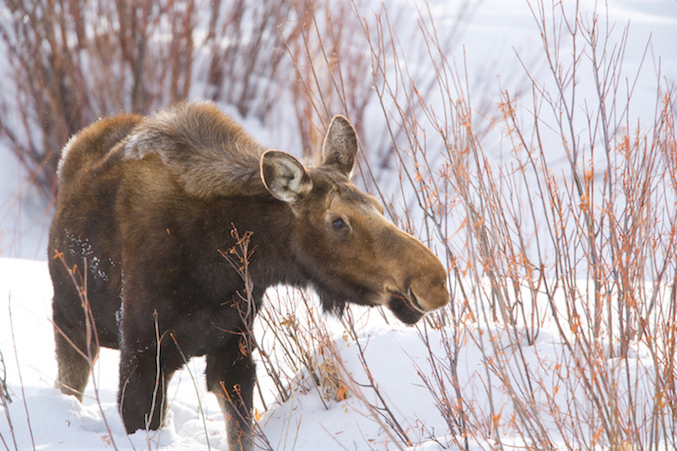 Adventures by Disney® is excited to once again offer departures of the Winter in Wyoming trip. This enchanting itinerary showcases the breathtaking beauty and stunning natural wonders of winter in Wyoming and Yellowstone National Park. Wouldn’t you like to dash through the snow-covered countryside on a dog sled, soak in the invigorating waters of Granite Hot Springs or discover the glory of winter in Yellowstone National Park with its snow-covered mountains, steaming geysers and majestic wildlife roaming the countryside? This 5-day/4-night winter adventure departs on Jan. 14, 2017 and Feb. 12, 2017. Beginning this week, you can join some of your favorite Disney characters as they live out their Hollywood dreams in two new character greeting experiences. 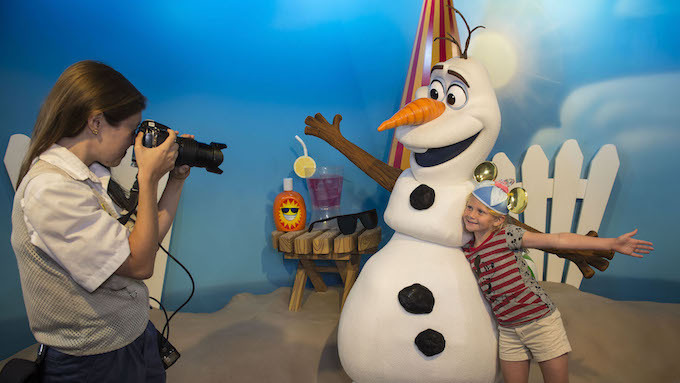 In Celebrity Spotlight, located in the park’s Echo Lake district, You are invited to meet that lovable snowman Olaf, from Disney’s blockbuster film “Frozen.” Olaf is living his dream “In Summer,” chilling on the beach and ready to give warm hugs to all his new friends. Just around the bend on Commissary Lane, you will find “Mickey and Minnie Starring in Red Carpet Dreams.” Here, you will discover Mickey Mouse and Minnie Mouse, living the dream as A-list Hollywood stars. You can walk the red carpet and step right into a scene with Minnie, where she appears as a Tinsel Town starlet in a ritzy setting straight out of a lush and colorful musical extravaganza. Next, you can join Mickey in a scene from “Fantasia,” where he’s portraying his iconic role of the Sorcerer’s Apprentice. Olaf is in the Celebrity Spotlight now, while “Mickey and Minnie Starring in Red Carpet Dreams” makes its debut on Sunday, May 8, 2016.